The marijuana that the Guyana Police Force said was Found in possession of one of its members. 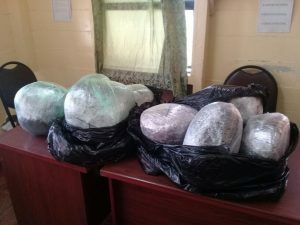 A policeman was Friday arrested after he was allegedly caught with 21 kilogrammes of marijuana in the car he was driving, the Guyana Police Force said. The law enforcement agency said tge arrest was the result of “intensified collaborative intelligence” between anti-narcotics police and the East Coast Demerara division of the police force. He is stationed at Force Headquarters for Trafficking in Narcotics. The policeman, who was driving a vehicle that was Georgetown-bound,was intercepted on Cove and John Public Road East Coast Demerara, about 9 O’clock Friday morning. Investigators said the marijuana was contained in several taped parcels.